Allen was just asking me about the VNC demo I gave at Picademy and I thought I would just do a follow up post here for everyone. So the aim will be to install the VNC server software on Pi and the VNC viewer software on the host computer (which will show the Pi desktop). The guide includes instructions to make the VNC server start automatically when the Pi boots up (recommended). 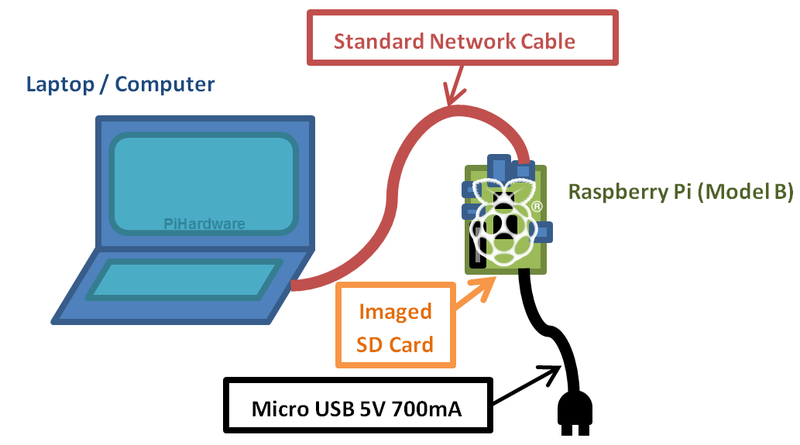 This is the method you'll want to use if you have untrusting network administrators who refuse to allow a Raspberry Pi to be connected to the main school network. This way each Raspberry Pi will be directly connecting to a host computer using a single Ethernet cable, thus making a completely isolated point to point network between the two and therefore your network administrators shouldn't have any cause to complain. Note: you don't need a cross over cable for this, a standard cable will work because the Pi Ethernet port auto-switches the transmit and receive pins. Firstly we'll need to install some software on the Pi, so for this first part you'll need to connect it to a LAN for Internet access. We’re going to make the Pi Ethernet port behave in a similar way to a home router. This means assigning a static IP address to it and installing a DHCP service (dnsmasq) that will respond to address requests from the host computer. The first line tells dnsmasq to listen for DHCP requests on the Ethernet port of the Pi. The second line is specifying the range of IP addresses that can be given out. The third line provides the default gateway for the host computer (which won't actually be used here). After the Pi boots back up, give it a minute or so, and you can go ahead and plug in the single Ethernet cable directly from the Pi to the host computer. You can now open up your VNC viewer on the host PC and connect it to the Pi. When prompted for the remote host enter: 10.0.0.1:1 and click connect. It could also be 10.0.0.1:0 depending on how you set it up in step 1. You'll be prompted for the password that you chose during step 1 and after that you'll see the Pi desktop and will be able to get going with Scratch or whatever. Remember that 3D games like Minecraft are not going to work using this method, those draw their image directly to the local screen memory and will be ignored by VNC. You'll just see an empty window. Undo the change to /etc/network/interfaces (put hashes on the four lines you added and remove the hash from the original line). Run sudo apt-get remove dnsmasq from the command line. Davespice, that's great. Using similar technique in school myself, we've switched on the Internet connection sharing option in windows PCs and left the Pi on dynamic IP. The Pi belong to our pupils so they go home each evening and static IP wouldn't always work on their home network. We then use a combination of Avahi on the Pi to broadcast it's IP and Bonjour on the PC, this means the Pi can be addressed by name and consistently accessed with ease. Sorry, stupide question. But I wanted to print these instructions, but there are always some line(s) missing...How it could be done best? You should be able to print it from there. Unfortunately minus the diagram ! This forum is made in PhPBB, so there is the posibilitie to add the print icon so that posts can be printed! guidolavespa wrote: This forum is made in PhPBB, so there is the posibilitie to add the print icon so that posts can be printed! CTRL+P works in my browser. I-cant be doen it , for shore . My B+ is updated to the latest (apt-get update and apt-get upgrade). It works. I can connect to the VNC from my Yosemite Mac. How do I get it to start automatically? SuperWoman wrote: How do I get it to start automatically? That sets it up to run on boot as well. Is that available for the Mac? SuperWoman wrote: It works. I can connect to the VNC from my Yosemite Mac. Well, to be precise, a Windows 7 VM running in Parallels will connect. When I try to start the vncserver it tells me its already running on #1, but I can connect unless I try to manually start it. I followed the instructions mention earlier in the post to start the VNC server at boot which saves a few seconds each time you reboot the pi having to ssh in to start it. which works great, thanks. I also modified the vncserver command in the script run at boot time to run the server as user 'pi' rather than 'root' which is what it was doing. My question is whether this is good practice on Linux systems? richlane wrote: I also modified the vncserver command in the script run at boot time to run the server as user 'pi' rather than 'root' which is what it was doing. My question is whether this is good practice on Linux systems? Now I can use my Pi with my iMac and I no need more to connect to the TV. My girlfriend will be really happy. The lag is minimum compared with wifi connection or ethernet through the router. Congratulations!! It's a great tutorial, easy and clear. PS. It works faster with Real VNC Viewer than other solutions. Could be possible to connect internet through the same ethernet cable?? I've no idea if it's possible or not. I've only just seen this, for some reason Raspi has stopped emailing me whenever a 'watched' topic posts another message. I was wanting to use something like this for my developing project, so extra thanks for the tutorial. The new 'Minecraft over VNC' build is IMMENSE! I have reloaded NOOBS to get the version that includes VNC Server on the Pi and it is running OK. I have loaded up VNC Viewer on a Windows 10 PC and entered the Pi IP address from my local network. However, a window then comes and asks for a user name and password. Could someone please advise where the user name and password come from.